I have to be honest, I don’t like every single detail about this home, but I love the general layout and palette so much that I just had to share it with you. 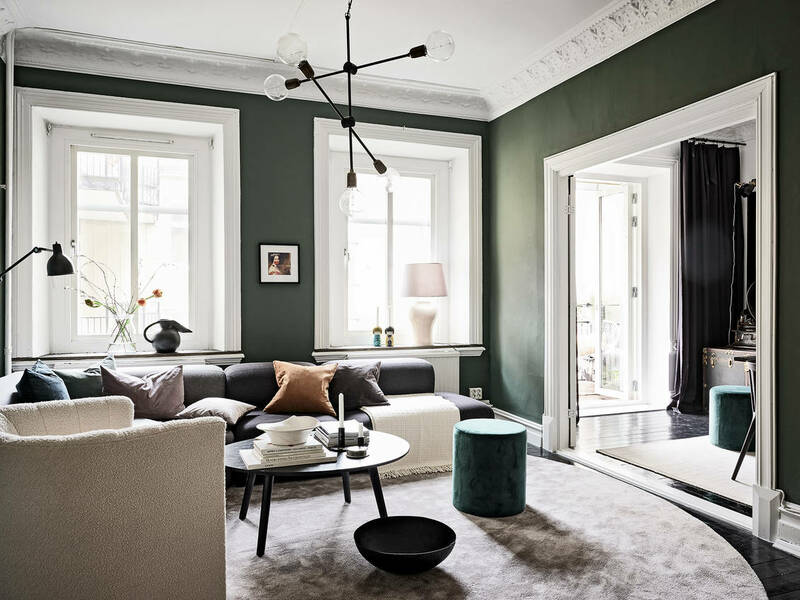 This lofty space has been painted white entirely and the furniture has some nice black and dark grey contrasting pieces. 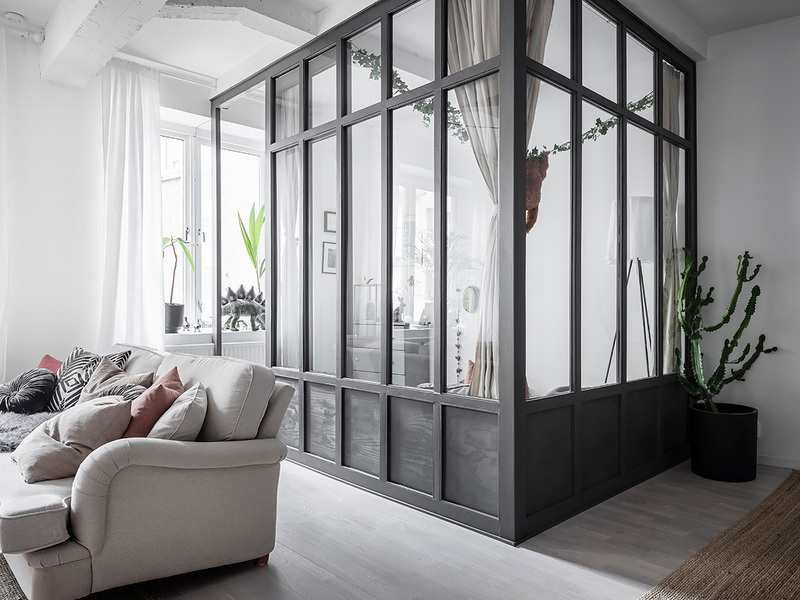 I love the way the glass partition was used in the living room to create an extra space for the kids room. This way natural light still flows into the kitchen and dining area while dividing the room into 4 different areas: a kids room, living room, dining area and office. 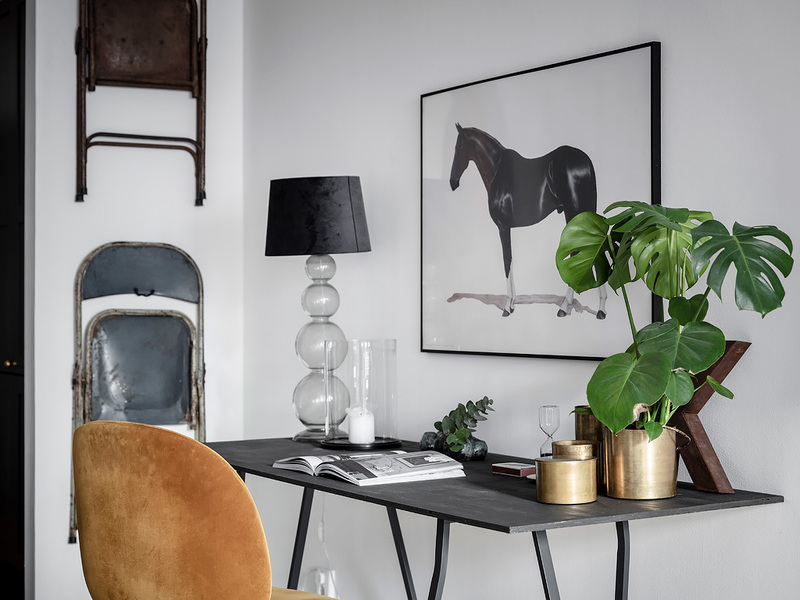 The little black office table fits very nicely against that white wall and I like the velvet okra Gubi chair there. 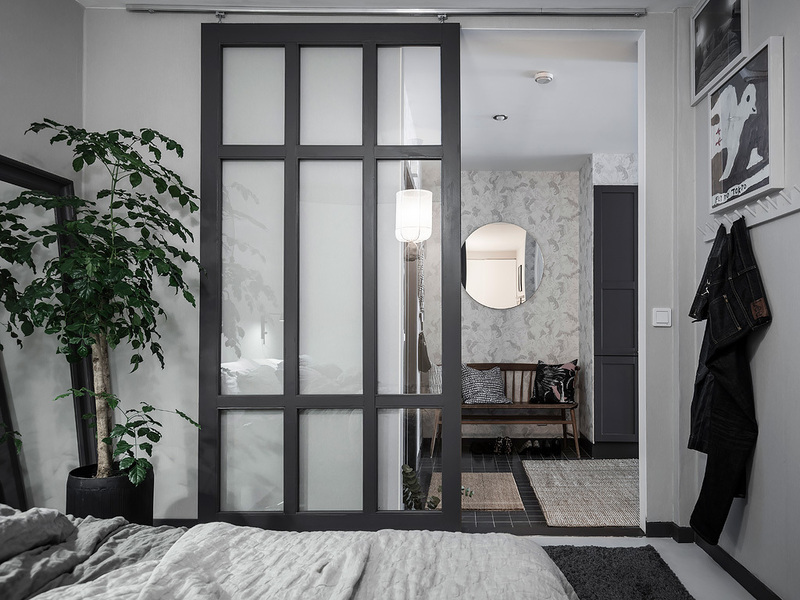 The same style glass partition comes back in the master bedroom, to separate the area from the hallway. How cute is this wooden hallway bench by the way ? 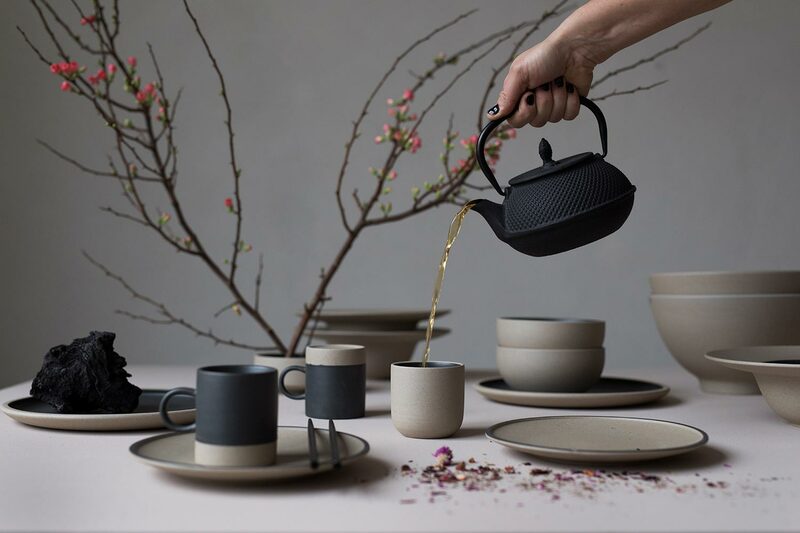 These beautiful and minimal porcelain series is called Fumiko and is designed by Swedish Byon. The stylish yet timeless pieces can be combined in several ways and can be mixed and matched with other pieces as well. 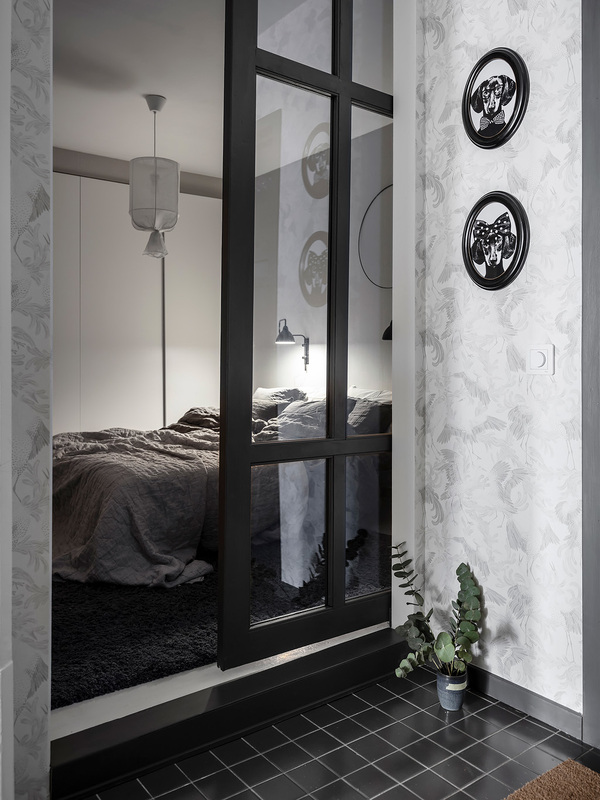 I love the combination of the beige and black matt porcelain treatments, they work so nicely together for a soft and minimal look that is powerful yet quiet. 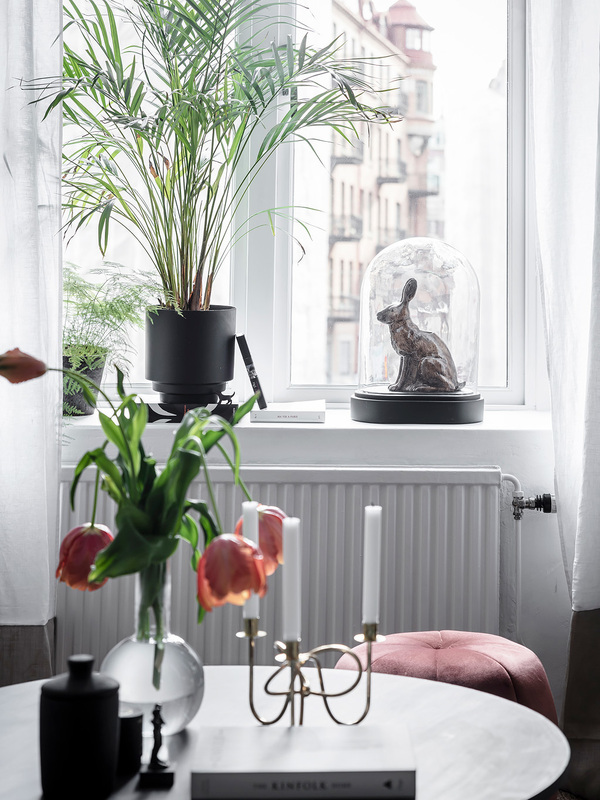 The styling you see here was done by Sarah Widman, photographed by Bodil Bergqvist. 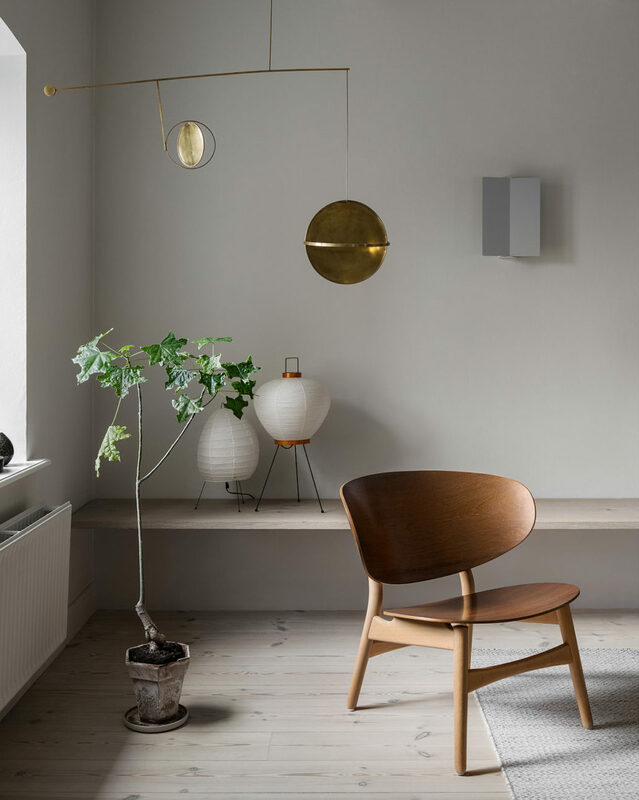 I love the calm vibe this home radiates. 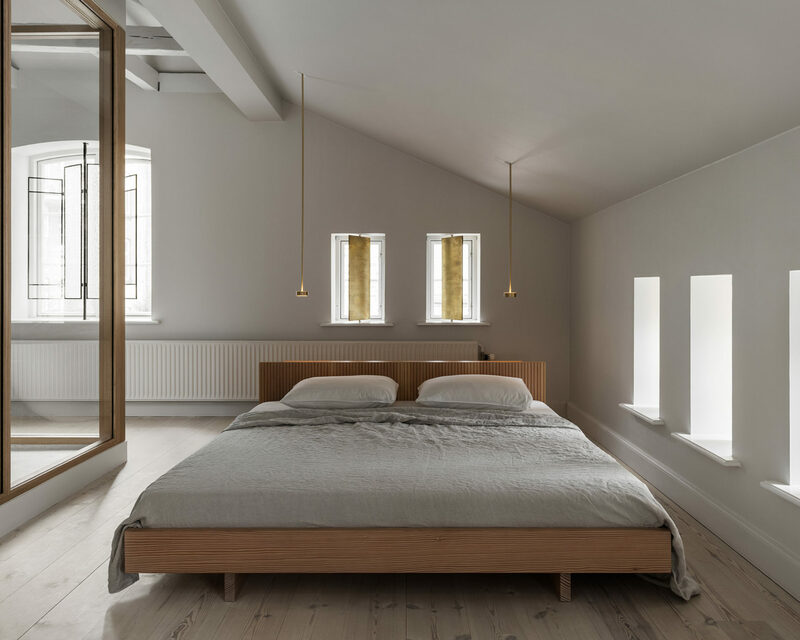 I think it must be all the fresh natural light coming through the windows combined with the natural and neutral beige color palette. 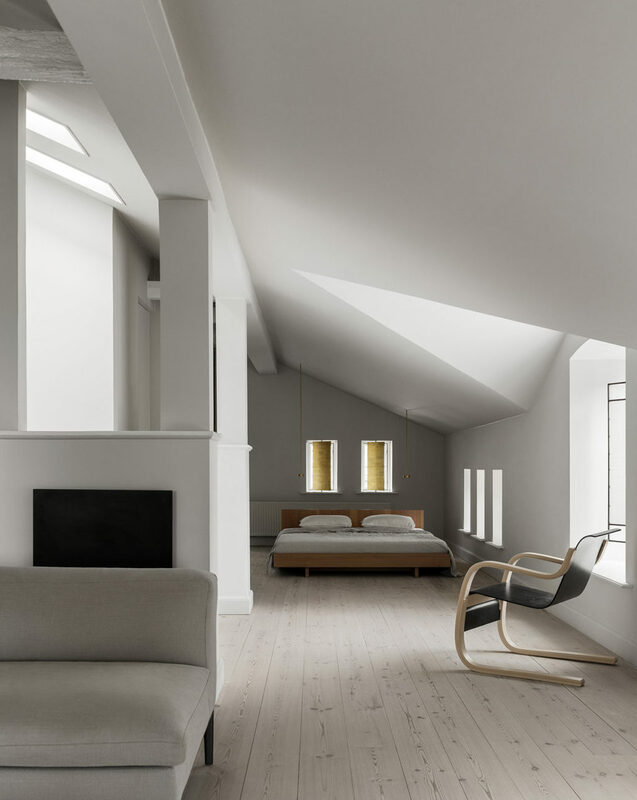 The walls of this home are painted in a different range of beige. 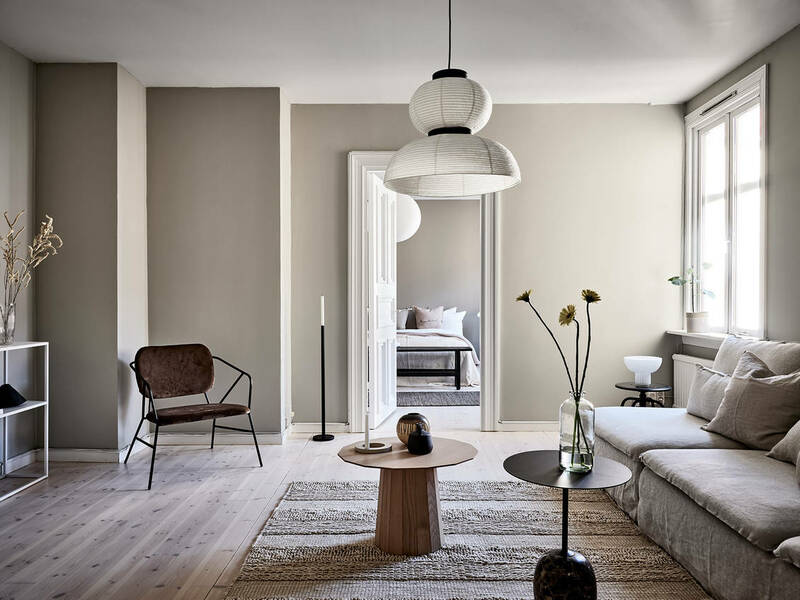 The living room has a very warm beige tint, while as the bedroom has been painted in a darker and more grey toned tint. 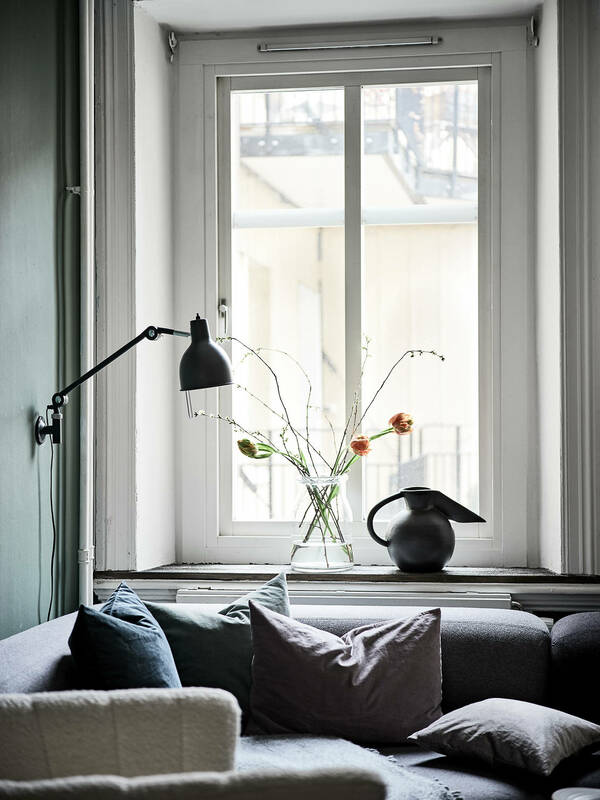 The Ikea Söderhamn sofa (updated with a linen Bemz customized slip cover*) almost blends in against the wall and the rest of the accessories and textiles are also kept either tone on tone or in a black contrast material. 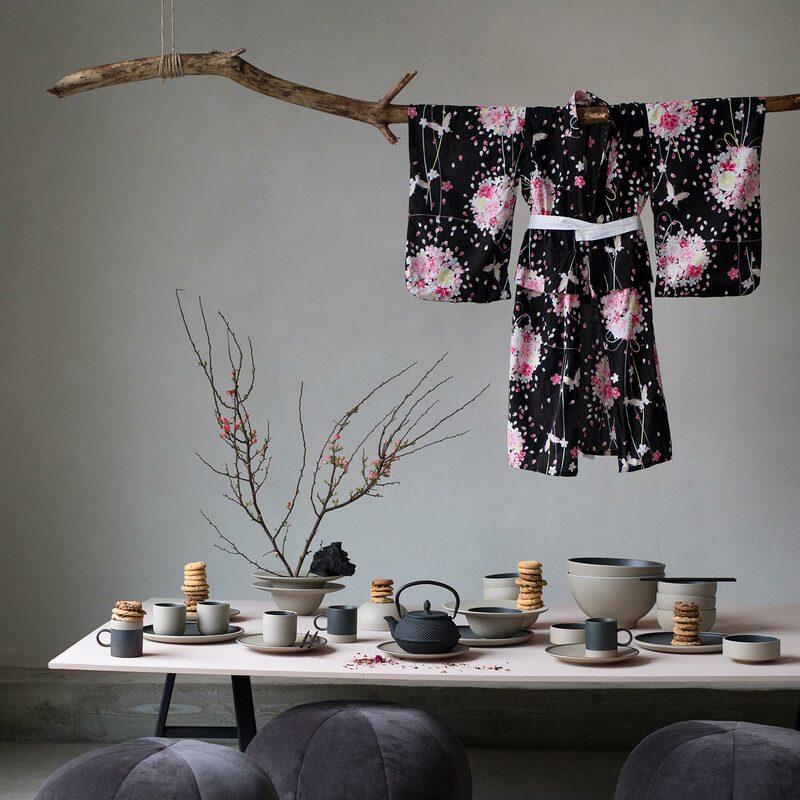 I love the &Tradition Formakami lamp* here as well, it’s not heavy and matches this light look. 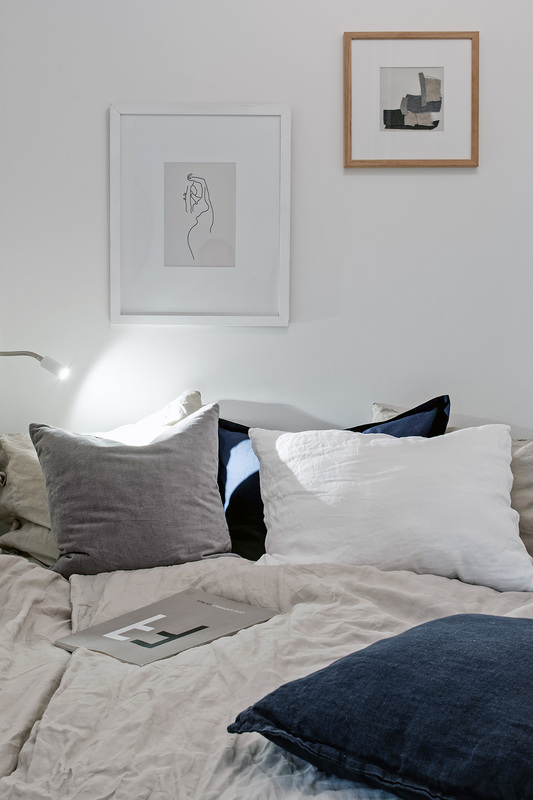 The paper lamp in the bedroom has a similar look yet is even more simple in its design. In such a simple color palette and setup I love how the plants and flowers stand out so much. 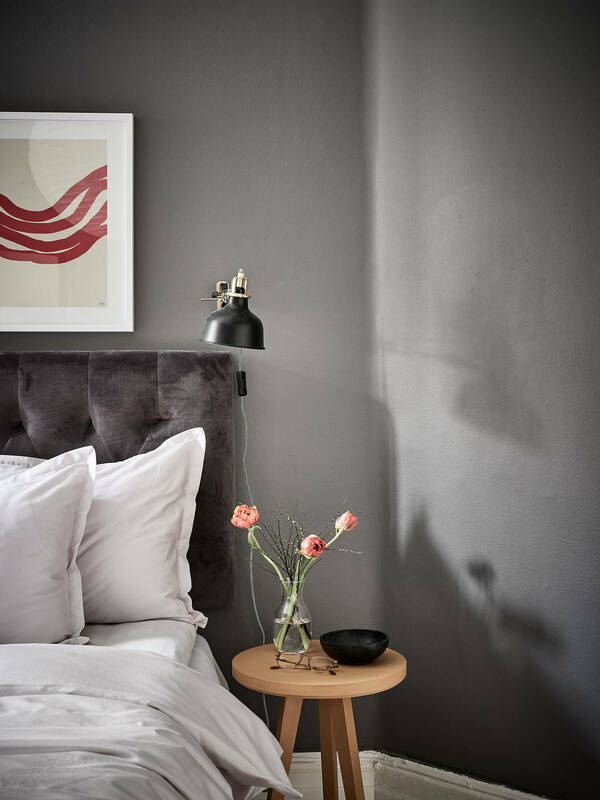 Look at the big plant on the bedside table, it really pops out against the darker wall ! 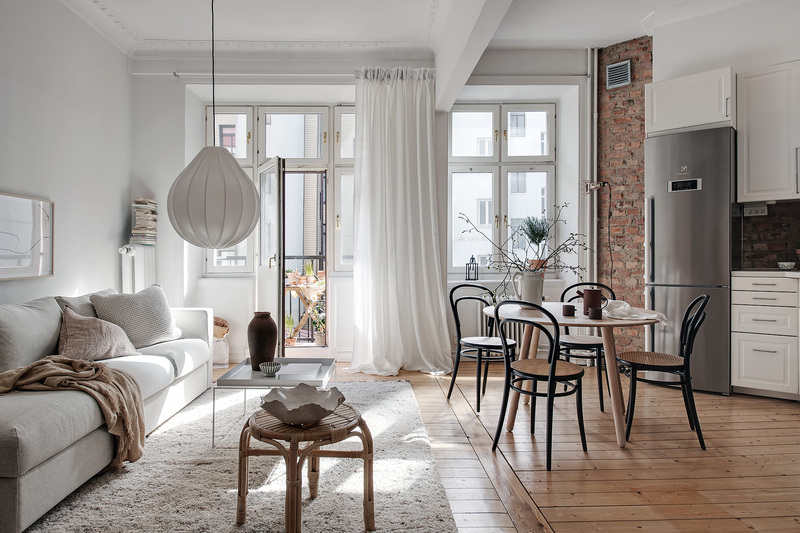 I’m totally getting a summer vibe from this amazing apartment. Also, seriously, how fresh and dreamy does the bedroom in this home look ? 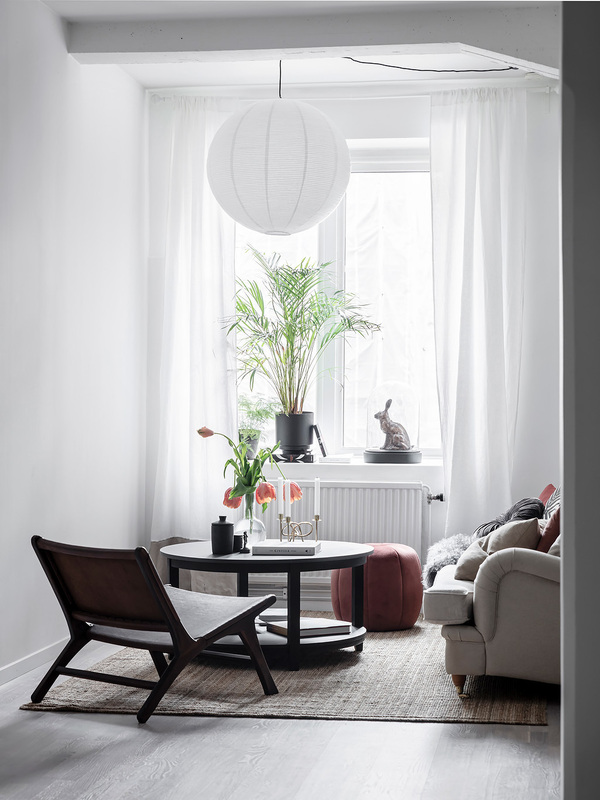 The white sofa in the living room combined with the fluffy white area rug and the details in white, wood or terracotta make for a very natural yet fresh look. 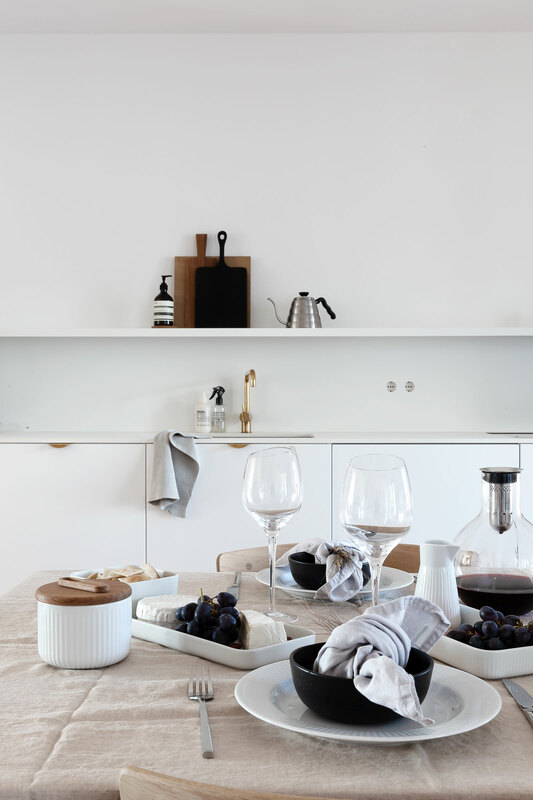 The round kitchen table with the black Thonet bentwood chairs* is just a dream come true and makes me want to change my dining table at home as well. 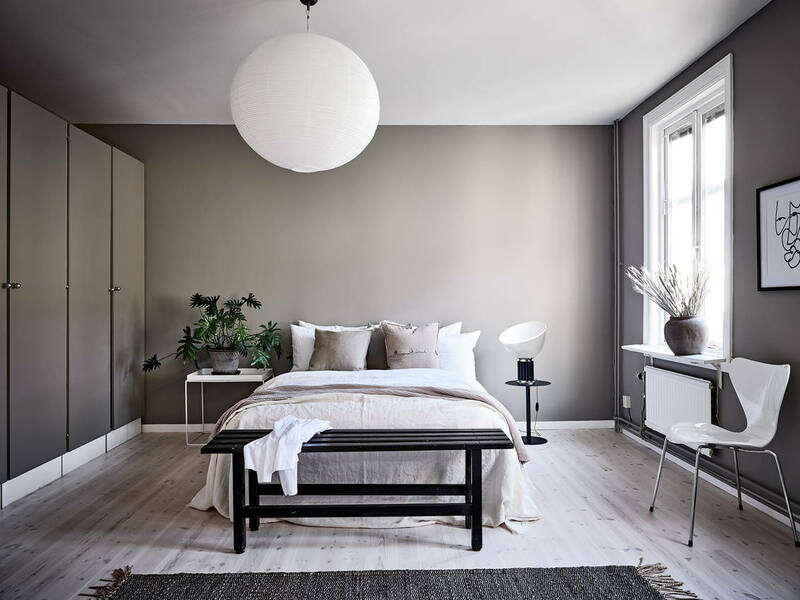 The contrast of the dark grey wall combined with the fresh white linen in the bedroom looks amazing and the round mirror reflects the room in such a nice way. The climbing plant is a nice finishing touch to this fresh and dreamy bedroom look. I had some friends over at my place for tapas and wine the other day and decided to decorate the table according to the spring weather. I kept it light and simple, just like the food. Sometimes I like to cook a nice meal when people come over, but having people over for wine is just so much easier, you almost don’t have to spend any time in the kitchen. I used a beige linen table cloth from H&M Home* and paired it up with their grey linen napkins*. I used some dried grasses and tied a knot around them for a nice deco touch on the plates. I got some inspiration from Pinterest for this table setting and started a Table Setting Pinterest board as well if you want to get inspired as well. 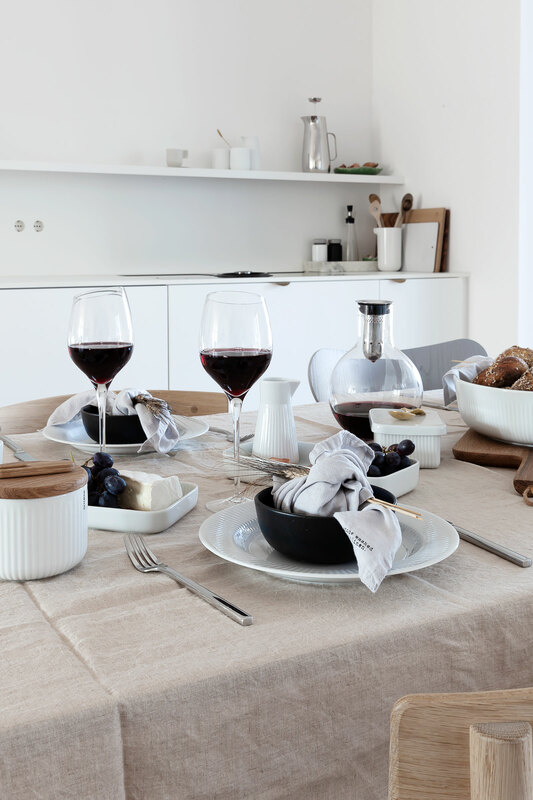 The wine glasses* and accessories (I’m in love with their wine decanter*) are all from Eva Solo. I also combined their Legio Nova* and Nordic kitchen series on this table setting. 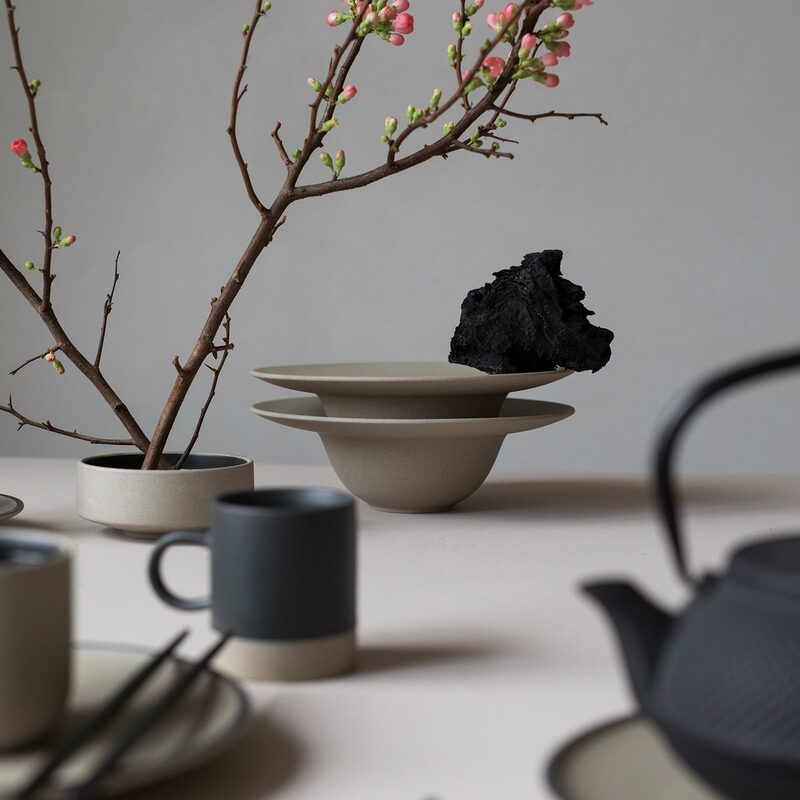 I love the combination of the black bowls* with the white porcelain and the linen. I think the living room in this turn of the century home looks just amazing. 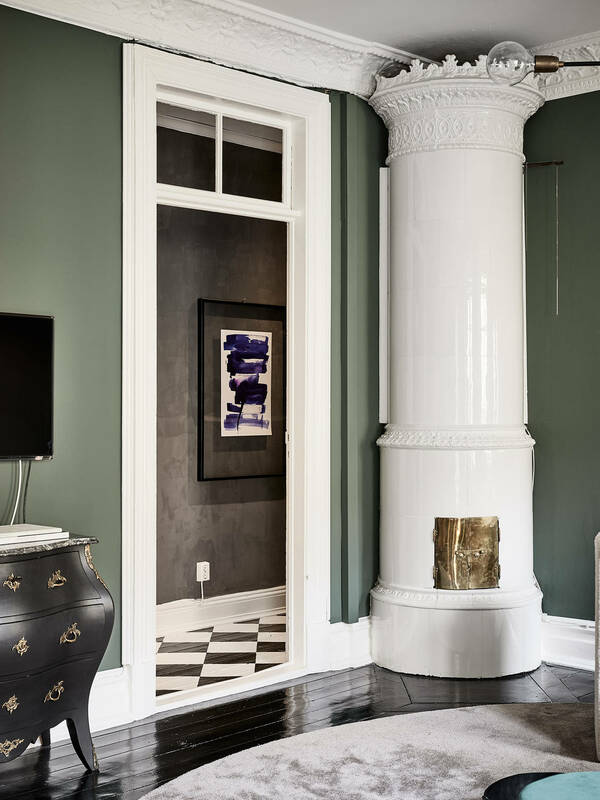 The green color of the walls stands out perfectly against the black floor. 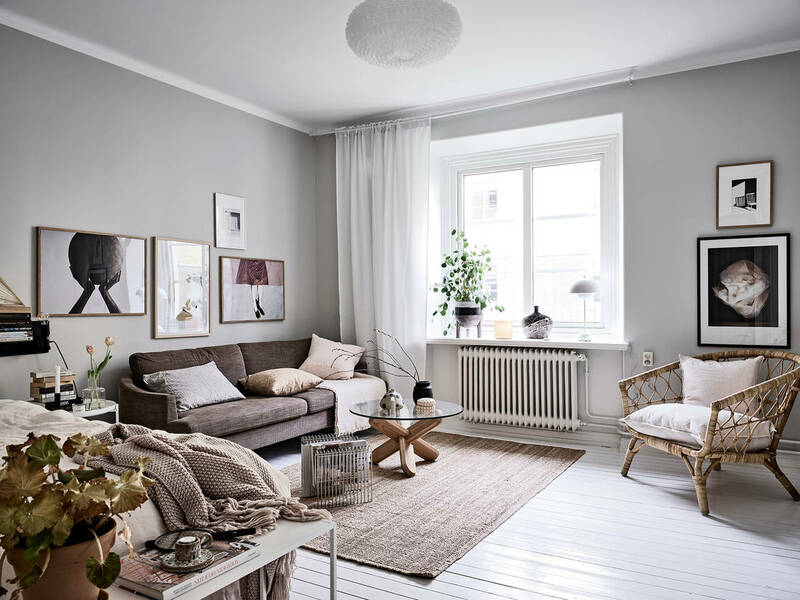 A dark floor can make the whole look a little dramatic, so a big area rug like the grey one you see here can soften things up a lot. The Menu Harrison chandelier* looks very impressive underneath such high ceilings and I really like the sheepskin armchair from &Tradition* against the dark green walls. 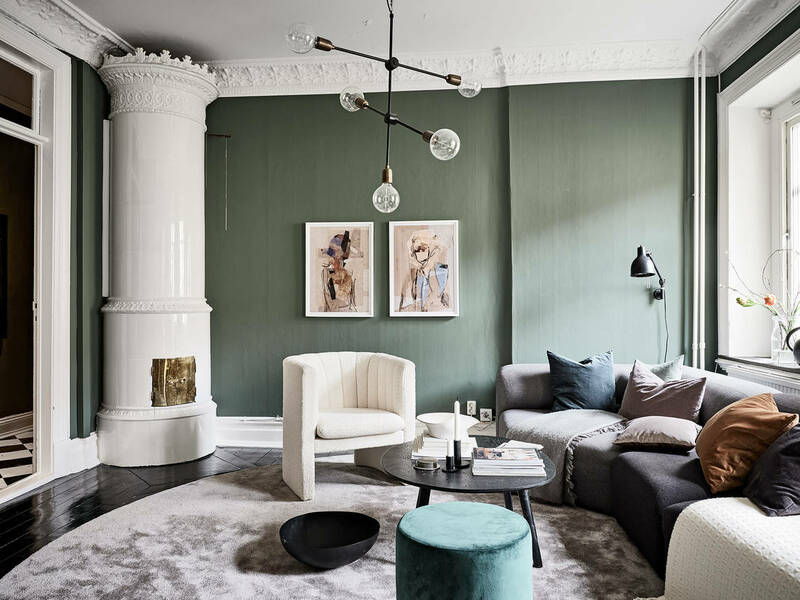 The velvet green pouf is such a perfect addition as well and makes the color palette come together. The bedroom in this apartment looks very nice as well. 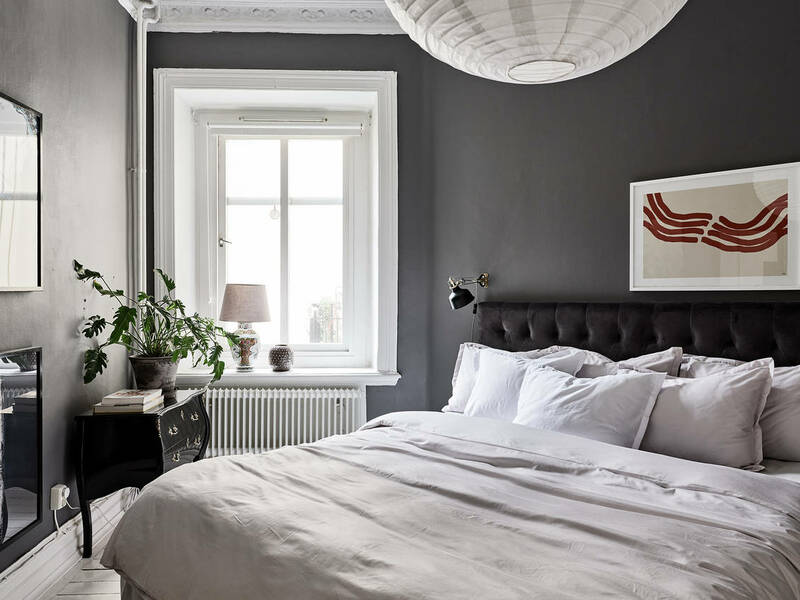 The dark walls combined with the white bedsheets make for a great contrasting look. The rest of the apartment is not really my style, that’s why I didn’t share any more pictures here, but you can have a look at the full place here. Did you get the spring cleaning bug already ? The nicer weather certainly got me organising but since I moved into this apartment pretty recently I don’t really feel the need to deep clean it like I usually do in Spring. 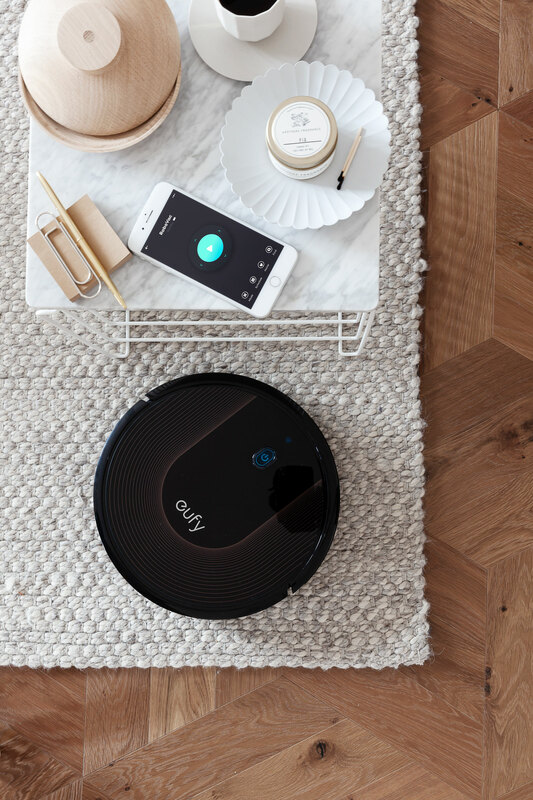 I recently got the RoboVac vacuum cleaner from Eufy, as shown in the picture below and this has been helping me a lot in keeping the house clean throughout the week. In case you are also interested in getting one for your home, they are having a spring cleaning sale until April 7th*. I have gone through all my clothes as well and am tackling every corner of the house to try and find the best way to organise things. If every object has a spot, it will get less chance to become messy and I know what I have at all times (I hate it when I buy something and realise I already had it at home, which happens sometimes). 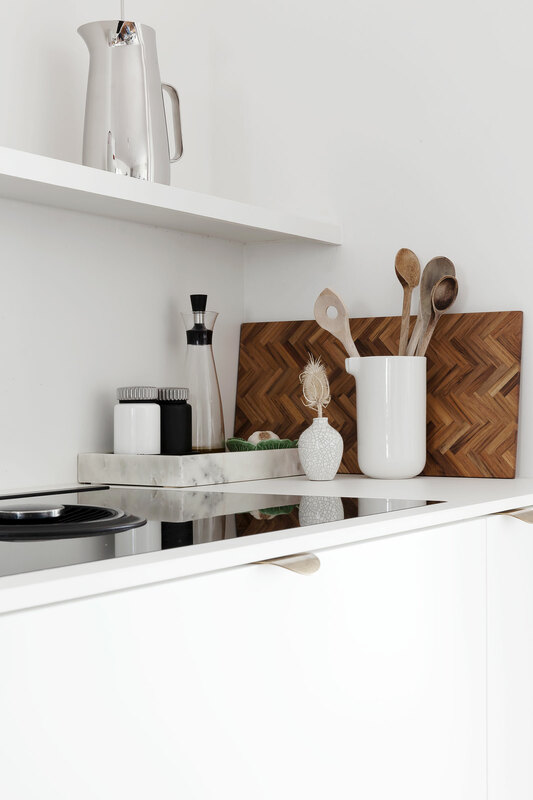 I will do every corner of my home gradually and started with the kitchen, which now looks pretty organised. I have this wide built in open shelf on top of my kitchen, which is great for displaying things, but I started to add too much stuff. I emptied it again and only keep a few things there, which makes the look so much nicer. 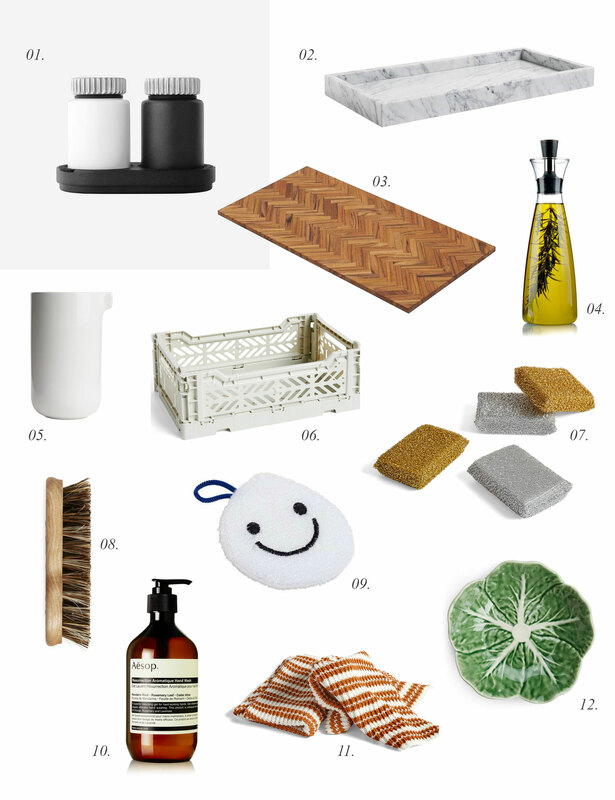 I also bought some fun cleaning supplies like the HAY smiley face sponge and am keeping a crate* next to the sink to keep cleaning supplies together. 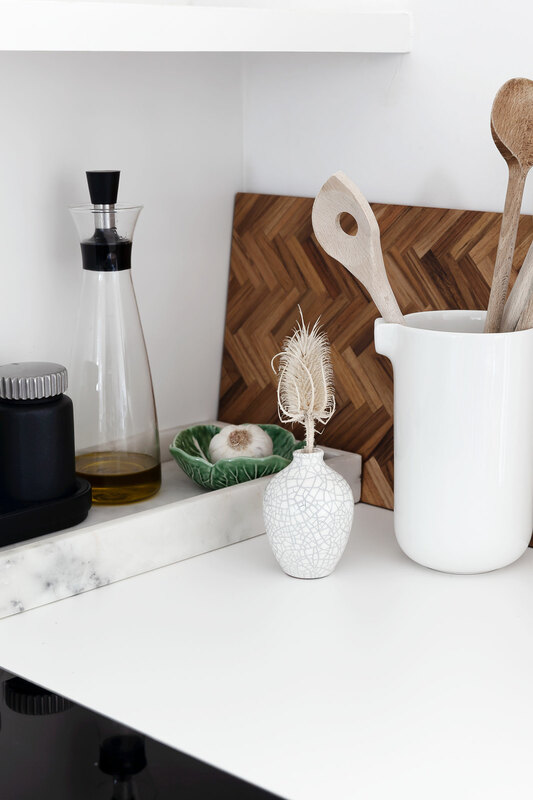 Next to the stove, I placed a mixing jug from Arket* which is keeping all my utensils close by and I love those little green Bordallo cabbage bowls* for keeping my soap at the sink and for keeping garlic. I now have two of them but will get some more for my kitchen cabinet as well. Some of the items in the pictures are kindly gifted and some of the links I used in the post are Affiliate links (marked with*), which means I earn a small commission on items purchased through these links. 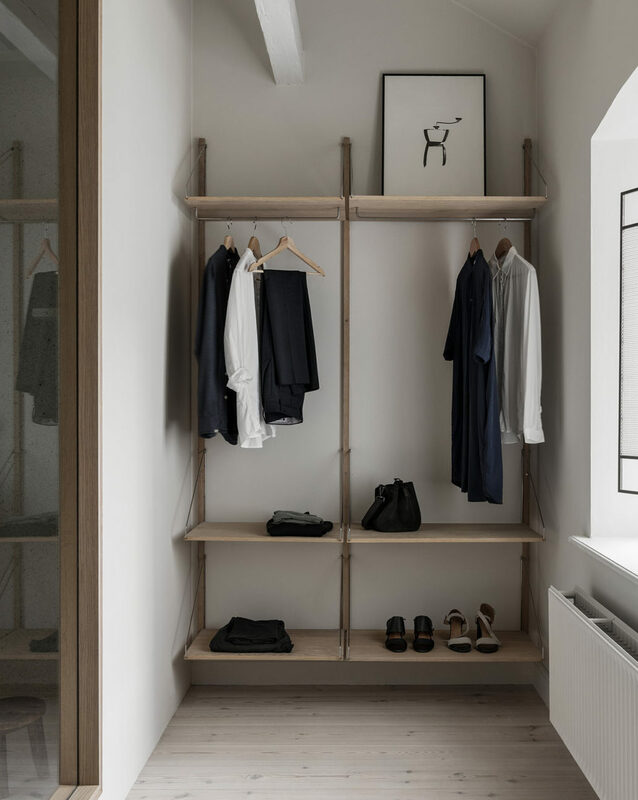 This minimal home with warm elements is a project that was recently completed by Frama. The protected building was created in 1878 and was used as stables. 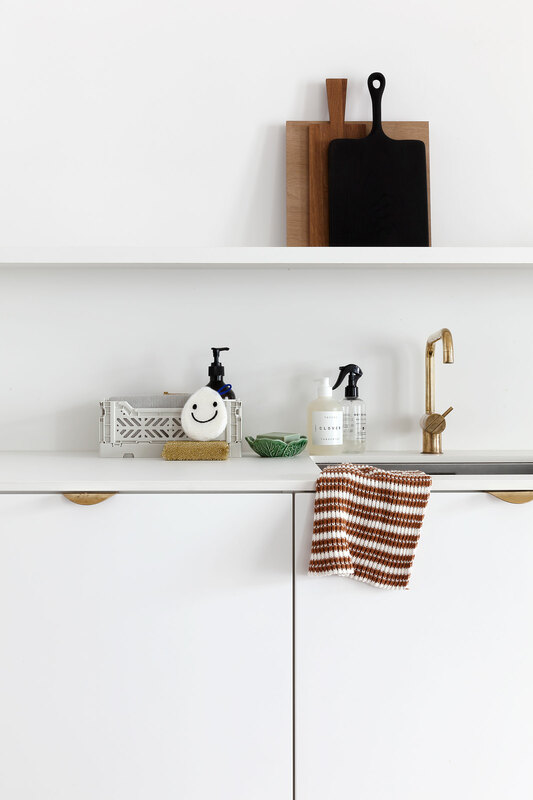 Now it was converted into a residence where a series of stylish details included pivoting brass shutters, a terrazzo floor and a custom-made bed wrapped in solid Douglas fir. The result is a light, warm yet minimalistic feel where every detail of the custom-made furnishings and interior has been thought through. 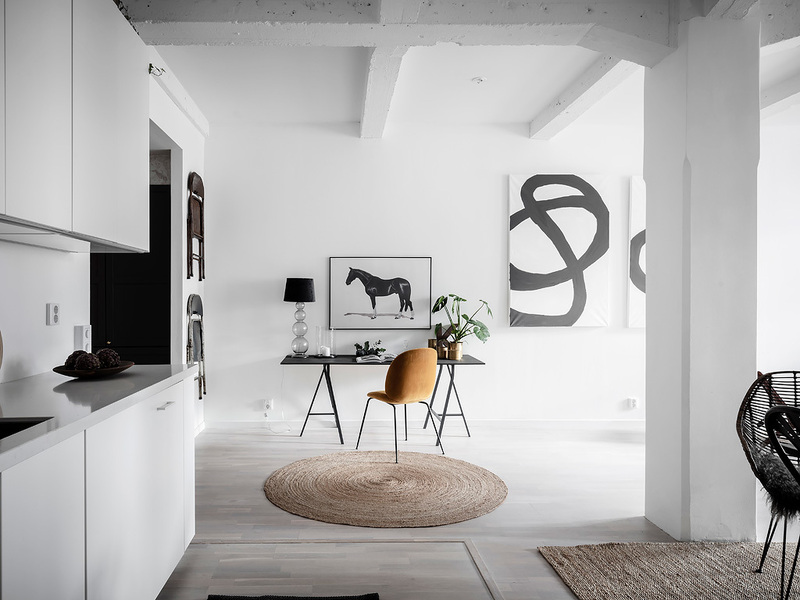 The color palette of this home is so simple, yet so striking isn’t it ? 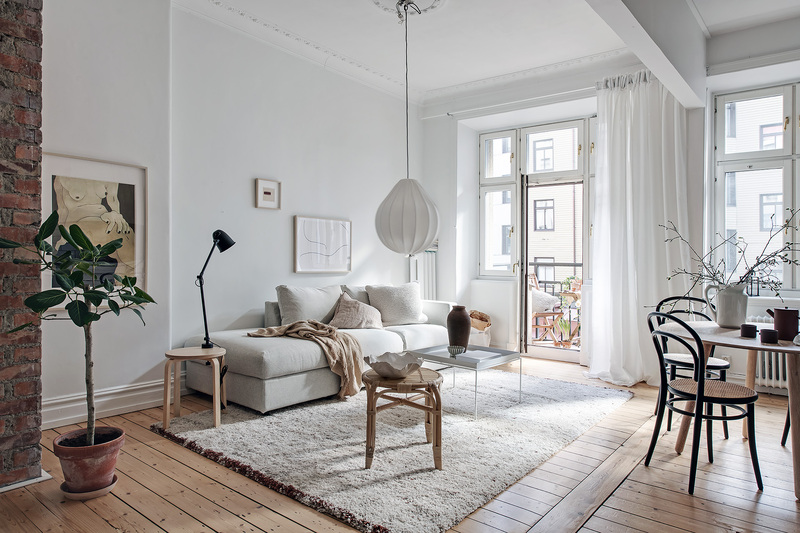 All the walls and floors are painted white, which reflects the natural light coming in from the windows. 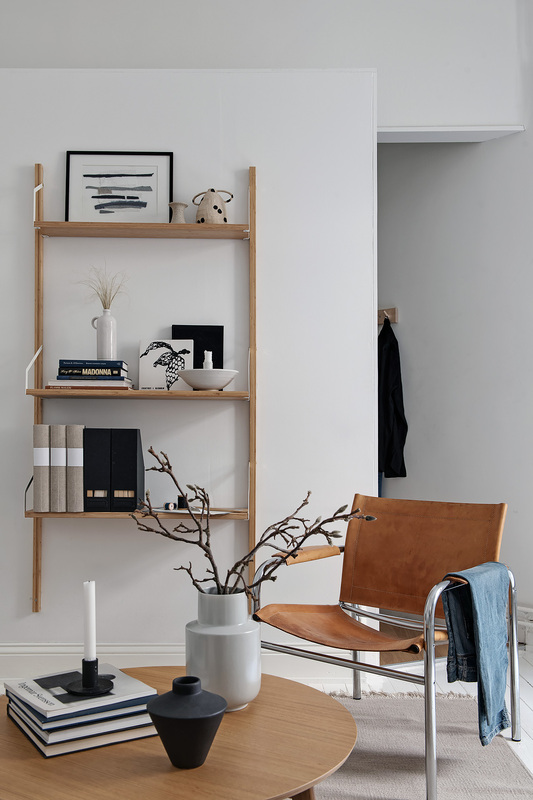 The furniture is a combination of black, beige and warm woods, which is enhanced with small elements in blue to create a more interesting palette. I love how these blue details stand out ! 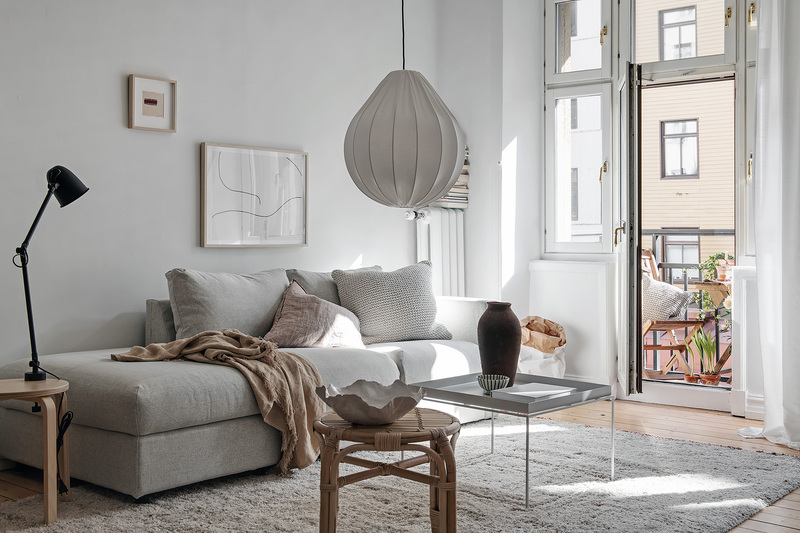 The sofa in the living room is the Ikea Söderhamn, customised with a beige Bemz slip cover in linen*. 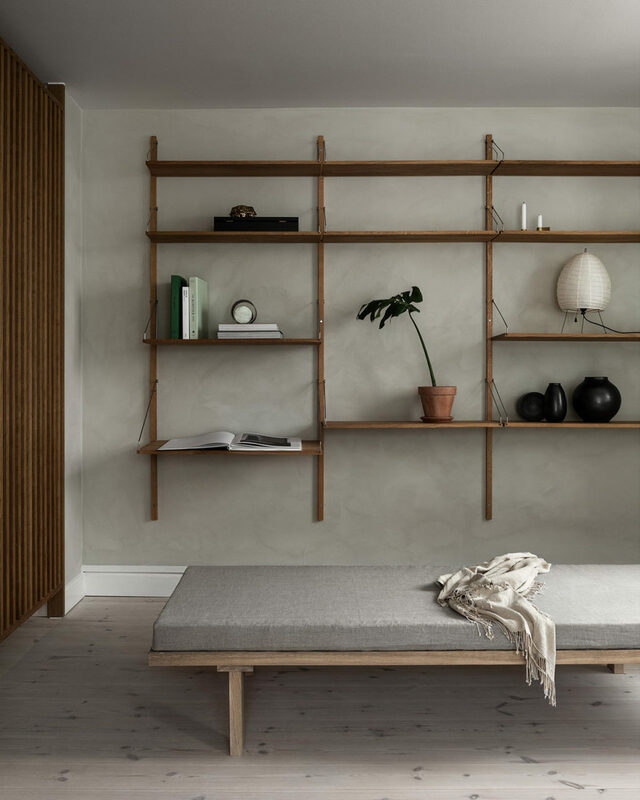 The beige of the sofa cover comes back in the area rug as well and the rest of the furniture has a very warm tint, like the wood of the Ikea Svaläs shelving system, the vintage leather arm chair and the oak wood coffee table*. In the kitchen I really like the small marble bistro table next to the window. It’s just enough to fit two people and I like how the marble of the table top combines with the Series 7 chairs in black*. A perfect spot for coffee and the newspaper in the morning I imagine. I like the mixture of warm and cool tones in this home. 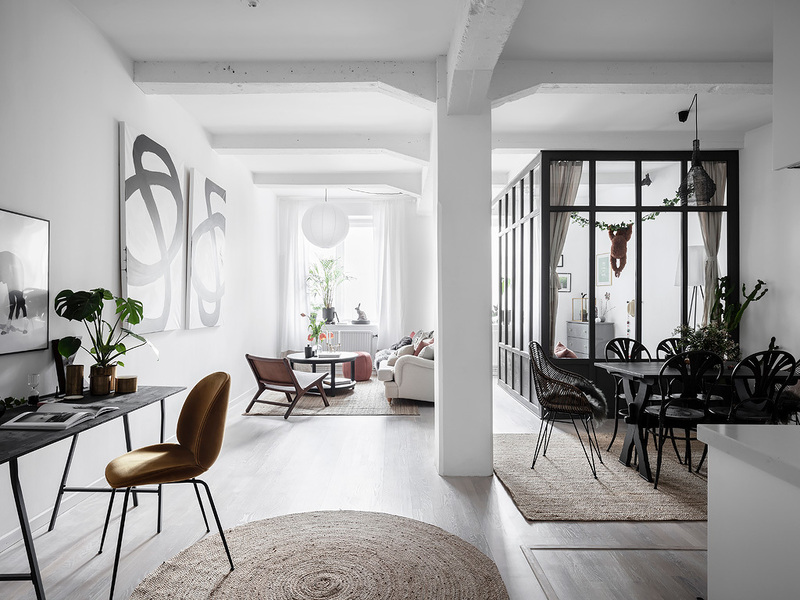 The natural light that is coming in through the windows is quite fresh and is reflected off the grey walls and flooring as rather cool (at least that’s what you see when you look at these edited pictures). 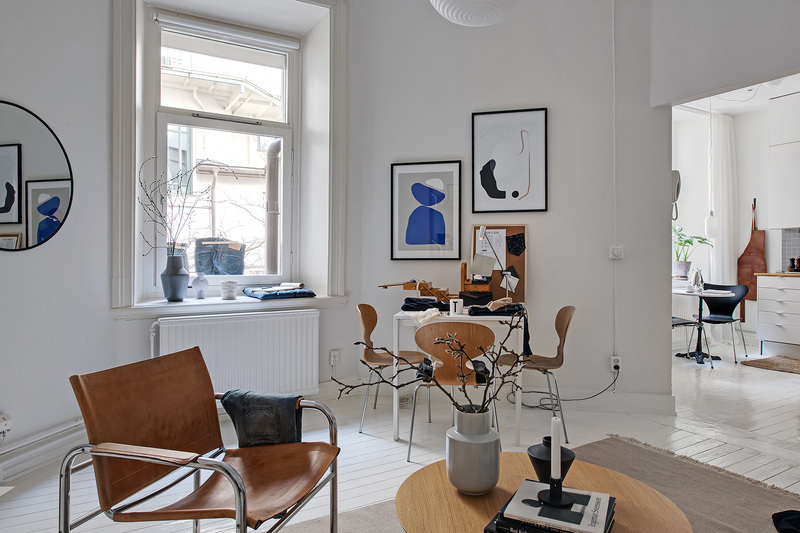 The accessories and furniture that are used to decorate the place all are in the warmer palette. This results in a fresh yet cozy look, which is the perfect middle ground to be in if you ask me. The living room is also the bedroom and even though things are quite close together here, the use of the area rug (I think it’s this one from Ikea) and the art wall separate the living room and bedroom ‘areas’ very nicely. The large mirror leaning against the wall makes this space look bigger as well, a nice trick. 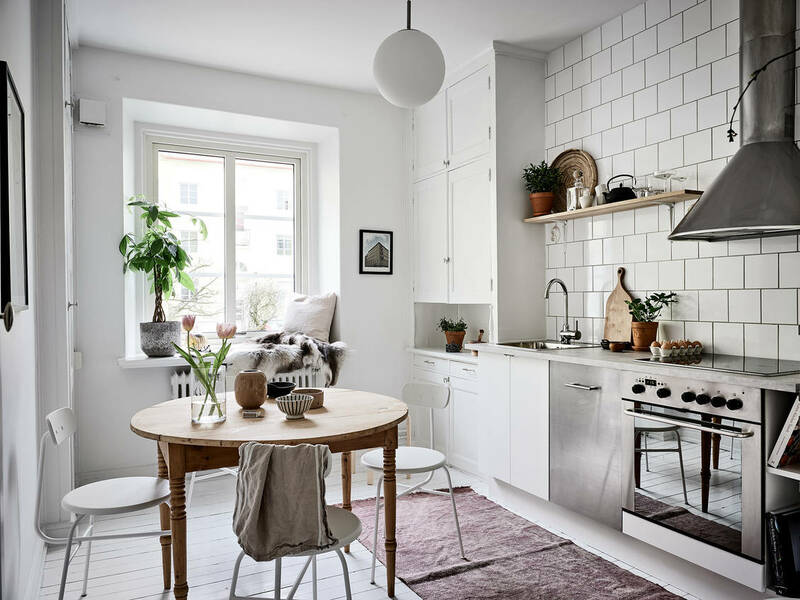 In the kitchen, I really like the combination of the round vintage dining table with the Menu Afteroom chairs*. The window sill has been transformed into a very cozy seating nook and I like the accessories in general in this room as well.